The following address was delivered at the National Workers World Conference held in New York City on Nov. 15-16, 2014. United States and NATO interventions in Africa and throughout the Middle East are increasing. From Egypt and Morocco in the North to Burkina Faso, Niger, Nigeria, Mali and others to the West, right down through the Sudans, Uganda, Botswana, Zimbabwe and South Africa in the Central, Eastern and Southern regions, the Pentagon and the Central Intelligence Agency (CIA) is increasing its efforts to thwart the development of Africa. Africa is rich with mineral resources, agricultural commodities and a young, vibrant work force which the world capitalist system seeks to exploit at a maximum level. This phenomenon follows an historical process that extends back to the middle 15th century when Portugal and Spain began the Atlantic Slave Trade which led to colonialism and modern day imperialism and neo-colonialism. This year represents the 90th anniversary of the transition of V.I. Lenin, the leader of the Bolshevik tendency within Social Democracy that matured into the Russian Communist Party and the October Revolution, creating the world’s first socialist state initiating the formation of the Union of Soviet Socialist Republics (USSR). Viewing the organized working class and its natural allies within the peasantry and the nationally oppressed as the engine of revolutionary change in the present epoch, we recognize the paramount importance of the unity of the proletariat in the western industrialized states with the peoples of the world in the struggle against global dominance of the international finance capital. Of course the African people have fought against the ravages of imperialism since its inception. The destruction of the slave system during the 19th century and the anti-colonial wars of the same century along with the emergence of independent African states on the continent and in the Caribbean during the 20th century, along with the movements for Civil Rights, Black Power, and Pan-Africanism in the U.S. and other western states, illustrates the heroic role of the African workers, farmers and youth. These contributions have informed and re-shaped the contemporary outlook and contours of the anti-imperialist and socialist movements around the world. Despite the existence of 54 independent states on the African continent, today the principal struggle is against a new and more insidious form of exploitation and oppression, neo-colonialism. Dr. Kwame Nkrumah, the leading strategist and tactician of the African Revolution to emerge during the post-World War II era, not only fought for the liberation of Ghana, Africa and the unity of the continent under socialism, he observed and recorded the working of neo-colonialism noting correctly that it was U.S. imperialism that posed the greatest threat to the genuine liberation, sovereignty and unity of the people. It is within this context that we must examine recent developments in Burkina Faso where the masses rose up against the puppet of neo-colonialism Blaise Compaore. On Oct. 30 millions of people gathered throughout the capital of Ouagadougou and other cities around the landlocked state in West Africa demanding the ouster of Compaore, taking over the parliament and setting it on fire. 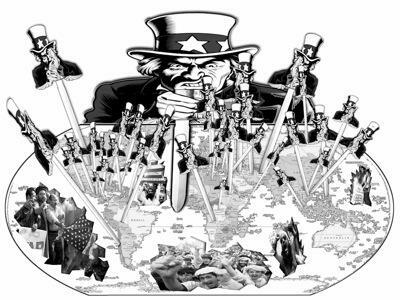 Nonetheless, the military comprador elites representing imperialism are still seeking to maintain control of the state on behalf of the mining interests and the U.S. Africa Command (AFRICOM). In Burkina Faso, the country has been utilized as a rear-base in the so-called “anti-terrorism” programs conducted by the Pentagon. This struggle of the workers and youth is not confined to Burkina Faso. To the south in Ghana, workers are emerging from a general strike where the public sector was paralyzed for two weeks, and the newly-emerging oil sector was hit by a work stoppage sending chills through petroleum industry worldwide. From Nigeria and Egypt to Zambia and South Africa, workers are demanding a living wage, decent housing, quality education and a society devoid of environmental degradation. Through Workers World newspaper these struggles are given not only prominence but they are placed within the context of the global class war encompassing the proletariat and the oppressed internationally. Our solidarity with the global fight against imperialism is the best policy in combating institutional racism and national chauvinism. The most outstanding example of solidarity with Africa is exemplified by the Socialist Cuba since the early 1960s. As Fidel Castro said in 1976, Cubans are a Latin-African people opposed to colonialism, racism and imperialism. Cuba has once again demonstrated its solidarity with the continent in practice by responding to the latest outbreak of the Ebola Virus Disease (EVD) in three West African states. These are not acts of charity no more than Cuba’s intervention in defense of Algeria during early years of its independence; its campaign against neo-colonialism in Congo under the direction of Che Guevara in 1965; and its deployment of 350,000 internationalist volunteers in Angola between 1975 and 1989, playing a decisive role in the overall liberation of Southern Africa from white settler-colonialism. Today Cuba sends thousands of healthcare workers throughout Africa and the world. The Latin American School of Medicine (ELAM) trains physicians internationally, even those from nationally oppressed communities in the U.S.
Over the last few months Cuba has shown the way in responding rapidly to the outbreak of EVD in Sierra Leone, Liberia and Guinea, where approximately 5,000 have died and twice as many have been impacted. Cuban officials recognized along with the World Federation of Trade Unions (WFTU), that the EVD outbreak and its devastating social and economic effects is a direct result of the legacy of slavery, colonialism and neo-colonialism. In order to reverse the lack of healthcare infrastructure and resources in far too many African states, it will require a decisive break with imperialism. Africa must move towards socialist development in order to ensure its future. As historical materialists we understand the difference between quantitative and qualitative development. There can be quantitative growth without real development. Although African states have experienced escalating rates of foreign direct investment (FDI), it does not necessarily translate into qualitative development in the areas of addressing the social conditions of the majority of the populations. It is only through a delinking with imperialism and the construction of socialism that Africa, and indeed the world, will realize the abolition of poverty, economic exploitation and imperialist militarism. Through the organization of the working class and nationally oppressed in the imperialist states we can build solidarity with Africa and the peoples of the globe.